The Days of Johann, an agility dog! : A great rescue! Yesterday afternoon, Mum and I were watching the news on Channel 13 here in Indy when they broke in with a live news report. It was of a rescue in progress by the Indianapolis Fire Department of a two-year-old Great Pyrenees. 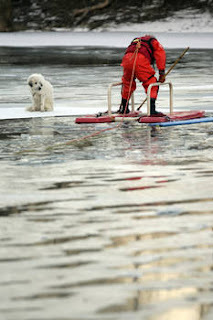 The pup who had been with a foster home, got loose and had been on the run for two days, when someone spotted Biscuit trapped in the middle of an ice float on the White River not too far from our home. The news stayed on the rescue until Biscuit was safely back to shore. It was so exciting and nerve racking! Biscuit had only been with her foster family for 24 hours before she bolted from their home and got lost. We're super happy that she's back with a foster family and soon she will be ready for adoption to her furever home through Indy Great Pyrenees Rescue. Having an older rescued pup in our house, Gracie, my sis, we know Biscuit has got to be super confused and scared. We sure hope she finds a great, understanding and loving home real soon! To read the entire story and see the video of the rescue, click here! Thanks to Channel 13 for your great coverage of a heartwarming story, and the Indianapolis Fire Department for coming to the rescue! And to the Indy Star for being on the scene to report the story and supply great pics for today's morning paper. And remember, pups, be careful around ponds, lakes, and rivers, they can be super dangerous this time of year here in the Midwest and in other parts of the country. They may look frozen, but chances are they aren't!